Seagreens® nutrition ingredients are free from harmful allergens, contaminants, toxins and microbial pathogens, irradiation, GMOs, and manufacturing incipients. Nothing is added or extracted, and all our nutrition studies are conducted on the whole seaweed - not 'extracts'! This independent, applied nutrition research is published in international peer-reviewed scientific journals. We began this 20 years ago in Norway in 1997, and developed the first production in the British Isles in 2009. From 2008 we have led the field and been awarded for our production, applied nutrition research, and products. We are the only producer in the British Isles and Nordic region with two decades of analytical data on the safe, continuous use of our products and ingredients for human consumption. 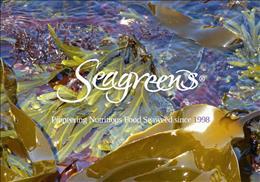 With Seagreens, you know what you are eating. Seagreens' extensive accreditation is your assurance of consistently superior quality, with international regulatory compliance. We are happily endorsed and used by nutritionists, medical and dental practitioners, health and food societies, and other manufacturers in Europe, North America and Asia. Our manufacturing customers include many of your favourite brands, including Artisan Bread, Bart Spices, Duchy Organic, Macacha, One Earth, Pukka Herbs, Tisso, Viridian, and others. Healthcare professionals, nutritionists, and manufacturers - please take a look at our Nutrition Research Presentation or enquire at info@seagreens.co.uk. Consumers, please click on the photograph over on the right for a short presentation. Seagreens® Consumer Products are available throughout the British Isles and many other countries from good health and natural food stores and clinics, and by mail order worldwide. They are 100% Seagreens® seaweed, packaging is 100% recyclable, and all our products are suitable for all age groups in organic, vegan, halal, kosher, therapeutic and special needs diets. Our products focus on nutritional value and ease of daily use - whether you are using them for flavour, preventive health, nutritional therapy, bodycare, or animal nutrition. In recent years, working with the Seaweed Health Foundation and the Biodynamic Association, we have contributed our know how to Nutritious Food Seaweed - the world's first standard to require independent, comprehensive, compositional profiling. Click here to read what Holistic Therapy magazine said about our human food quality wild Wrack seaweed a few years ago. Click the image for a short Presentation.